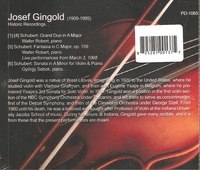 "Josef Gingold emigrated to the U.S. in 1920. He served as concertmaster of the Detroit and Cleveland Symphony Orchestras. From 1960 until his death, he was a beloved and sought-after professor of violin at Indiana University. During his tenure there, he gave many recitals and it is from these that the present performances are drawn."